It greatly saddens me that the days of little girls and their horse partners are gone. The woods and trails we rode are now housing projects and strip malls. It all has been replaced by high powered horses and structured "training" of both horse and human. I thought for awhile that the training methods had improved to the benefit of the horse, but sadly, I was wrong, I can't even watch these well known "trainers." The appalling cruelty just blows my mind. I can't believe these trainers even have a following. The fact that the horses learn anything at all is a tribute to their intelligence and adaptability. Much of it is no better than the old "tie 'em down and buck them to a standstill" method from years ago. They are not all bad, these trainers, but let your heart decide whether you want your horse to be exposed to these methods. Horses are extremely smart. They don't need painful repetition, they don't need to be terrorized into a "safe place." Once a horse understands a point, he never forgets. Make all your interactions with your horse as positive as you can, give him the benefit of the doubt. Horses are never wrong. Try to become his partner. If something negative happens, try again. Horses are very forgiving. Reinforce positive - and avoid negative - situations, if you can. 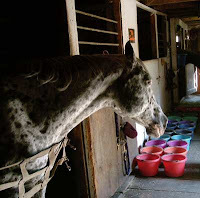 If a horse doesn't stand without ripping out cross ties, groom and tack up in his stall Find the easiest, safest ways for the both of you in all dealings. Don't set the horse up for failure. Treat him/her like a beloved child. Show him what you want. Sometimes they need time to figure things out. You see that "aha" moment when they get it. I was watching one well known western trainer as he forced a young horse to do a "departure into a lope, from a standstill, onto the correct lead, at the correct speed, with its head flexed behind the vertical, while giving to the bit to the left." Huh? 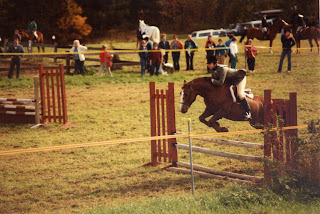 I couldn't figure out what was going on, let alone this good horse, who was never rewarded by a release of pressure! This beautiful horse had no spirit left, he just gave in because there was no escape. He took the punishment and abuse because he was given no choices at all, until he accidentally landed on the right combination the trainer wanted. He was dull and broken. I had to change the channel. I could not watch anymore. I'm not saying a horse doesn't need to be given a swat every now and then for an act of disrespect or foolishness (that is how they discipline each other, after all). Just stay within their rules. It's so much easier that way. Horse and human partnerships must always be at least 51% for the human, 49% for the horse. That 1% for you makes you the respected head of the team. Use it to your advantage and have fun with your potential life mate and best friend. Your horse is capable of loving you all of its life. One night while our teeny pony Bess was sick our vet said, "Why is this pony here? She should be with her family right now." Bess was 25+ years old at the time. 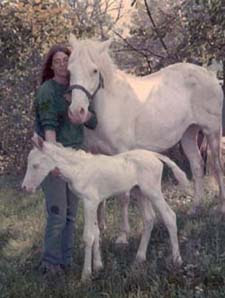 She was a tough little alpha mare about 9 hands tall. 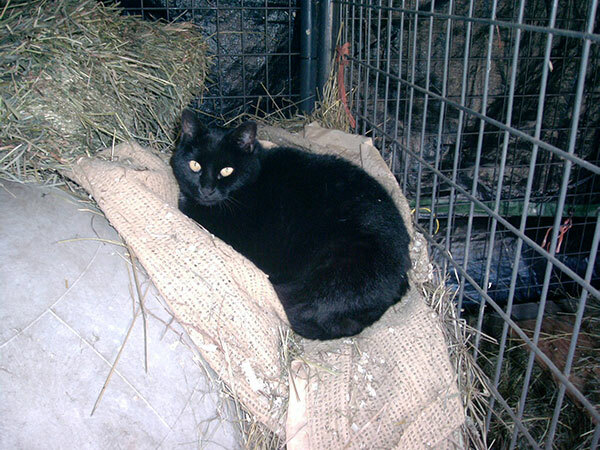 She came to us when her owner died. We became her family. She lived with us another three years. We assumed she was untrained as the only really small adult we ever had try to ride her was repeatedly slammed to the ground (all of my worst falls have been off ponies - one second they're under you, the next they're not). One day we tried her with a little girl. I swear, this pony changed before my eyes. Not only did she care for this child with every step, but wiped out the competition in the walk/trot class at the Bolton Fair! In that huge ring she trotted into every corner in perfect form! Two little girls rode her that day and won champion of the day! In a picture she looked like a fluffy kitten with the two little girls beside her. I was as proud as if I had created her myself. 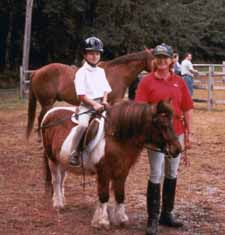 Who knows how many children she taught to ride in her 28 years! Two months later Bess died. In honor of Bess and all the unsung pony heroes that started all the famous/excellent riders on the way, we salute you and remember you always. 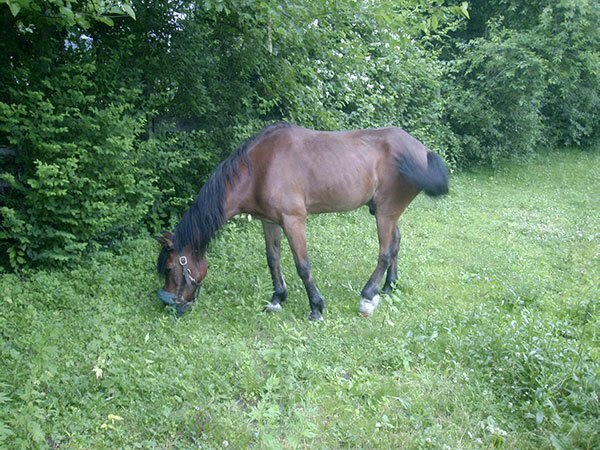 My beautiful little horse Willie has faded away before my eyes. It is time also for him to join his angel. He agrees, it is time to go. He has never been any trouble at all, he was just always there. 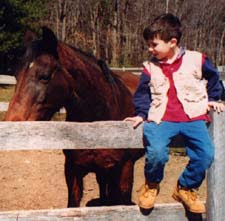 Always a good influence on any upset horse. His sweet calm spirit made all others around him feel safe. But he is very old and time has caught up with him. "Time and unforeseen occurrences befall us all." Ec.9:11 And so in honor of this dear one's life, we let him go with dignity. His pain is over. With all of his friends holding and loving him he fell asleep for the last time. 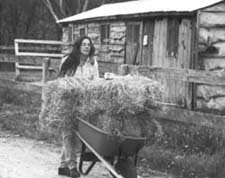 Willie taught so many about just how good and kind horses can be. Recently we were able to place two horses, Baladi, an Arab Saddlebred mare with an incurable lameness, and a teeny-tiny mini mare, Snowflake, into loving permanent homes. We are currently housing 14 rescued horses, most will have sanctuary with us for life. Please help us with their care. The education work goes on, as well. We are encouraging people to find ways to keep their horses, to be responsible for their care for life. We are also helping to support other rescues by sending them our excess of donated items such as halters, lead ropes, and stable blankets. We are trying to unite in our cause. We have a new piggy, though we are not technically a piggy rescue, we could not say no to this one. His owner, not wanting him anymore, put him in a heavy duty construction bag to suffocate him. He was rescued and brought to us very dehydrated and underweight. 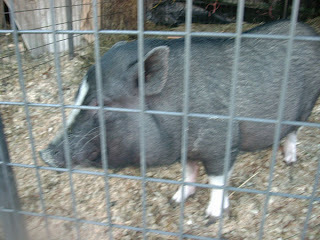 He now resides next to our other piggy and his cat in what we call the "pig pavilion." 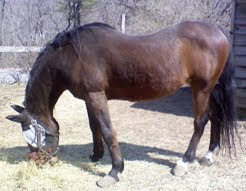 On Dec. 17, 2008 we finally succeeded in trimming 36-year-old Jaime’s hooves. We got Jaime 9 years ago when her owner died. She had spent all of her life, since she was three months old, in the company of cows. She was halter broke, but totally untrained in any other way. Whenever we tried to trim her overgrown hooves she would throw herself on top of us, willing to commit suicide and take us all down with her before she would ever submit to a trimming. This tough old mare is still beautiful – my favorite color, dappled mahogany bay. She glistens with health. Only her dentist knows she has five teeth missing, as she eats very well indeed. Other than the sway in her back you would never guess she was that old. The only health issue she ever had was an impaction colic that took four days to pass. We turkey basted mineral oil into her mouth, which she allowed us to do (sick horses are almost always submissive when they feel badly). She sucked down buckets of apple cider as she refused to drink water at that time. 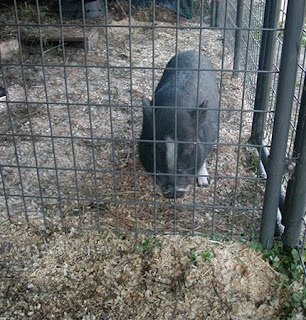 On the fourth day she passed a dried out, brick-sized lump of manure and was back to her old self. In those four days she stood in the corner of her stall like a rock, never groaned, never rolled on the floor, never showed any outward signs of the turmoil going on in her tummy. Tough old mare! I had pretty much decided that if the old girl didn’t want her feet trimmed, so be it. I could barely stand to look at her, though. I felt everyone thought I was neglecting her. So, we tried one more time. 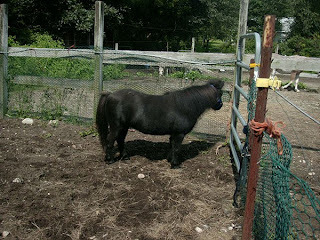 Our vet, Dr. Brett Gaby of Essex Equine in Bolton, came and gave her a tranquilizer and went to work. That old gal, barely conscious and drooling, still put up such a fight - rearing first, then sinking down on top of us - that I feared for us all. I found myself leaning on Dr. Graby as he tried to trim. The poor man was supporting the weight of both me and the horse. He gave her another dose of the tranquilizer. The battle continued. At one point as she started to sink again, we let her do so. I jumped on her head and held her down. Dr. Gaby had to extract himself and his tools from under her, but she was down and was going to stay there, by golly! For the next hour I sat on her head and Dr. Gaby trimmed all four of her hooves while she lay flat on the floor. She tried to get up a few times and Dr. Gaby had to step quickly amidst flailing legs. Finally, the job was done! We let Jaime get up. 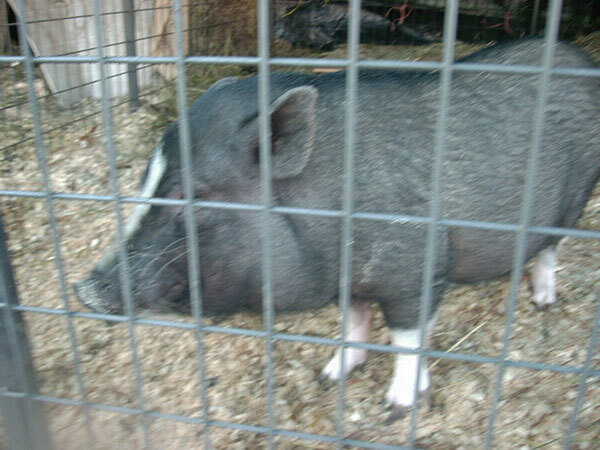 Her tongue was hanging out on the left side of her mouth, dried out, and covered with bedding. That meant she had been unconscious, but even in her sleep she had fought us! Dr. Gaby’s only complaint through all that hard work was “this is a very awkward position for hoof trimming.” Thank you, you wonderful man! I add one more hero to my list. Thank you! A friend whom I haven’t seen in ten years called me from Florida and said, “Nina, I can’t believe it – you’re famous! !” Well, in this day and age it doesn’t take much to be famous. Too bad I’m not rich, too. Any you may quote me. P.S. 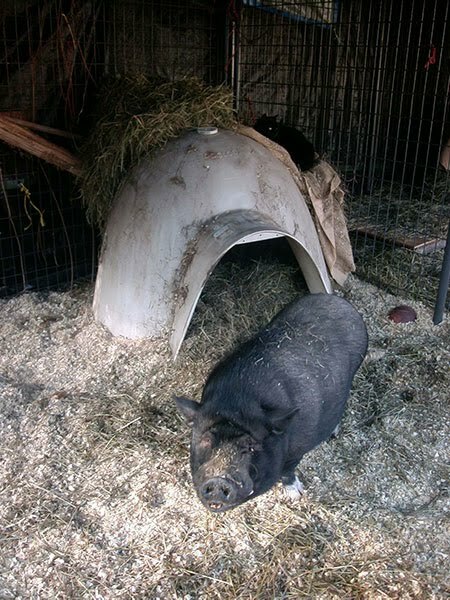 Our latest wishlist items: portable fence panels, a round pen, surveillance camera, and a video camera. It's OK with us if any of these items are used. Thanks for any help you can provide.